We had a ‘free’ training night in the sense that sensei let everyone work on whatever they wanted to and he came around helping people individually. It was an excellent way of learning as it enabled us to practice and get help with what we thought we needed to work on. Bernie was not a young man, he was what sensei would call an ‘earth’ person, obsessed with the practicality of everything and unable to see the health, skill and art aspects to what we did – and it showed on his face as he watched the younger Aaron working on his kata. “Wouldn’t work in a fight though would it? Bernie spoke with a sort of arrogant satisfaction. “Probably not” said Aaron, with a sort of bored exasperation, Bernie’s counsel was clearly not welcome and it was obvious that he was looking for an argument. The problem was that Aaron’s reluctance to engage was winding Bernie up further. “I’m sure you could Bernie, you’re one tough mofo…” Aaron looked directly into Bernie’s eyes with a sense of ‘you’re not going to leave this so let’s go to the bottom line’. Luckily sensei had made his way over to them by this time. “I can’t see the point of training like Aaron does… he’s living in some sort of fantasy land. Bernie made a move at Aaron and sensei caught his sleeve flashing him a warning look. “Right Bernie, downstairs in my office.” Sensei needed to resolve this. When they arrived at sensei’s office, sensei sat in his office chair but Bernie stood red faced and still angry. “You shoulda let me give him a wake up call” said Bernie angrily. “His namby pamby training’s gonna mean that he’s going to get seriously hurt when it counts” Bernie was very agitated. Bernie started to calm down as he breathed deeper, longer and was able to start ‘draining’ the energy locked in his head. “And you can’t see why?” asked sensei. “I admit I probably do go over the top, I just so angry…. I wish I didn’t. “What that kata?” Bernie looked like he’d just been hit in the face with a shovel..
“Precisely, you’re more likely to get yourself injured because of your temper and emotions than someone choosing to attack you if you were ‘chilled’” said sensei. 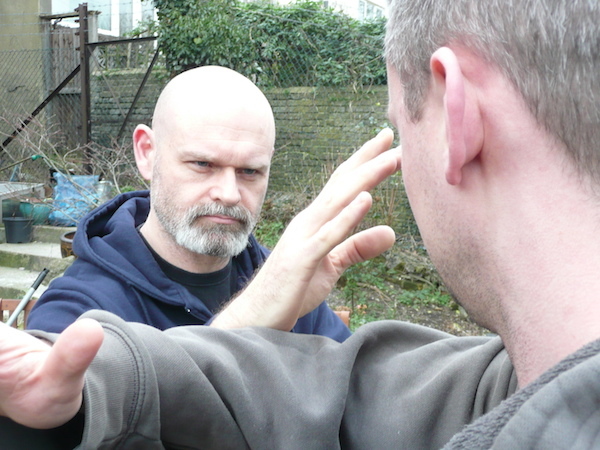 What Did The Shi Kon Tai Chi Coaching Programme Participants Think?